Designed to filter electrical current, the RX30 Filter Cord from Juice Goose features a single 3' power cord with a right-angle plug on one end and three receptacles placed 90° apart from one another on the other end. This filter cord also offers 1020-joule transient energy absorption, 3000 amp maximum applied surge current protection, and 6000-volt maximum applied surge pulse protection. Juice Goose RX Series power protection technology is particularly valuable because it works against ground line (common mode) as well as hot to neutral (normal mode) events. While ground line surges and disturbances don't typically cause catastrophic damage, they can result in operating failures and improper performance of digital processing equipment. Compared with the low operating voltage of processor logic, a power anomaly of even 1 or 2 volts on data lines or logic grounds can cause problems. That's why the RX Series products limit ground line voltage surges to only 1/2 volt. RX Series products also protect against more dramatic events. Connected equipment is safe from surges up to 6000 volts at 3000 amps on hot, neutral, and ground. The RX Series design includes a differential transformer, lots of filtering capacitance, and surge diverting components. Control circuitry provides protection from external wiring faults including hot-neutral reversal, missing ground, and overvoltage. RX technology delivers performance enhancement and protection comparable to an isolation transformer - but at a fraction of the price and in a fraction of the space. The cord improves performance of HD monitors and projectors while protecting your valuable investment. When high-frequency interference reaches your HD image through the power cord, image quality is lost along with much of the reason for going HD in the first place. At the same time, dangerous high-energy events you may or may not notice can shorten the life of your video machine. The Juice Goose RX 30 is built into the middle of a power cord ("Filtercord") to provide a convenient, easy-to-install package for use with non-racked equipment such as digital signage monitors, media players, and projectors. It can also be used as added protection for a rack-mounted power strip. 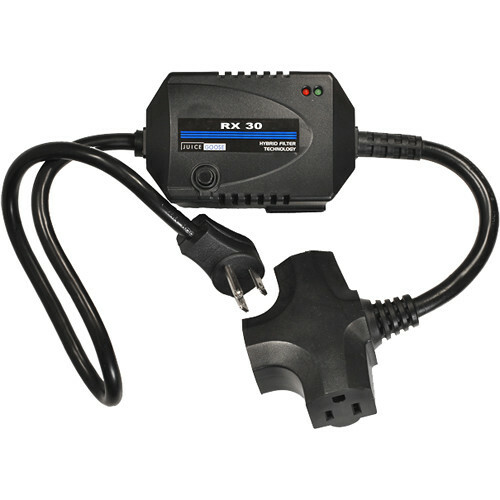 The RX 30 features a three-foot power source cable with a right-angle plug to lie flat against a wall. The power outlet side of the RX 30 includes three receptacles placed 90 degrees from each other to accommodate multiple components including AC adapters. This design allows for better filter module placement and connection with hard-to-reach AC outlets. Box Dimensions (LxWxH) 7.7 x 5.3 x 4.4"